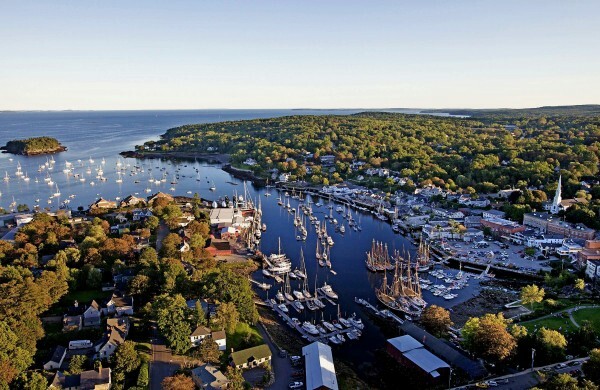 An aerial view of Camden Harbor, Maine. A Sept. 24 OpEd by Bob Campbell described the wondrous serenity of experiencing the sunrise over Penobscot Bay from the deck of his residence. Campbell is a Fox Hill Real Estate investor. The names of 21 investors in the company are still secret. “Sharing” the view is code for changing Camden’s coastal residential zoning to permit a commercial zone at 235 Bay View St. The reality is that it has been and continues to be a private residence. Everything “superfluous” was added for the enjoyment of the previous owner. It was never intended to turn a profit. Campbell then discusses the virtues of the proposed Fox Hill Real Estate lessee, McLean Hospital. McLean Hospital will not own Fox Hill, but it does own Fernside Rehabilitation Center in Princeton, Mass. There were no zoning issues in Princeton since the property was already a bed and breakfast and conference center. It has views of the Boston skyline, not the ocean. Since McLean would be a renter, there is no guarantee it will choose to stay at Fox Hill. Campbell goes on to say that the McLean Hospital will only accept the wealthy. After all, they can pay $60,000 or more a month. They are the ones who would make it profitable for Fox Hill investors. We believe the McLean patients are seeking excellent medical care rather than an ocean view that they probably have at home. Unfortunately, rich and famous substance abusers have attracted the attention of the paparazzi, which even the most secure of high-end rehabilitation facilities cannot control. The beauty and tranquility we enjoy would be threatened, so investors can turn a profit. There are a number of other issues, which remain undefined by Fox Hill. What would be the actual increased traffic numbers? Fox Hill has stated that there would be at least 56 trips by hospital staff per day. The additional traffic triggered by the unenumerated support services (catering, laundry, housekeepers, groundskeepers, inspectors, repairmen, etc.) remains undetermined. There is even the question of whether some of the property might be sold off to other types of businesses that could benefit from the property being rezoned while the residents lose out. Questions concerning sufficient water supply, septic system adequacy, drug regulation and fire safety also remain unanswered. Residents of Camden have worked diligently to preserve our abundant scenic venues. They enjoy walking, jogging, biking, skateboarding and strolling with their babies on Bay View and Chestnut Streets. Increased traffic, not to mention a potential paparazzi invasion, would destroy that enjoyment and put people at risk. Campbell lives in an unchallenged coastal residential zone in Rockport. Please share our view and our concerns. Urge the planning board to vote against the Fox Hill proposed change to the zoning ordinance. John and Wynne Phelan are residents of Camden.